The Moto E’s specification doesn’t stand out from the competition even with LTE and a faster processor. Instead it’s the design that makes Motorola’s new device a good alternative for consumers who want an affordable smartphone. With the 2015 version of the Moto E, Motorola Mobility is again hoping to get more people around the world to buy their first smartphone. Many low-cost smartphones suffer from a toy-like plastic construction, but the Moto E is more substantial, and even if the product doesn’t use any metal it feels more expensive than its $150 price tag. Motorola has made a couple of changes compared to the original model. The company has decided to stick with a rubbery plastic on the back and now also on the sides. The back is no longer removable; instead a band is removed to access SIM and MicroSD card slots. The smartphone still has a non-removable battery, but the battery has grown from 1,980 to 2,390 mAh. Motorola is also sticking with its lean approach to the Android user interface, in this case Lollipop. Less powerful smartphones can easily get a little sluggish when vendors make too many additions on top of the standard interface. The overall performance isn’t all good news, but put together you still get a good smartphone. 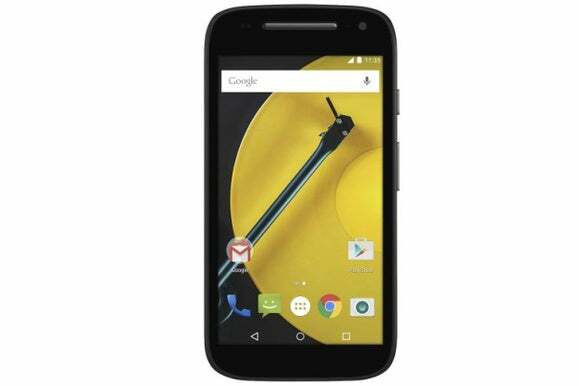 The upgraded Moto E has a 4.5-inch, 540 x 960-pixel screen and a 1.2GHz Snapdragon 410 quad-core processor from Qualcomm. The first iteration has a 1.2GHz dual-core Snapdragon 200 processor and a 4.3-inch screen with the same resolution. The low resolution still works on the larger screen, but it lacks the crispness you get on an HD screen and the colors are a bit muted. The processor can be found in much more expensive products and is a good choice. The new Moto E certainly feels snappier than its predecessor. The addition of LTE and 8GB of integrated storage are also welcome upgrades. Thanks to a new generation of chipsets, LTE is becoming a much more common feature. LTE is one of those features that you get used to quickly, but are also quickly reminded of when it goes away. The Moto E still has a 5-megapixel main camera and adds a front-facing VGA camera. The original model lacked a front-facing camera altogether, but people who buy the phone deserve something better. One of the more interesting parts of the Moto E’s improved specification is that its Snapdragon 410 processor has twice as many cores as the Snapdragon 400 in the more expensive Moto G, something that may inspire Motorola to launch an upgraded version of the G sooner rather than later.